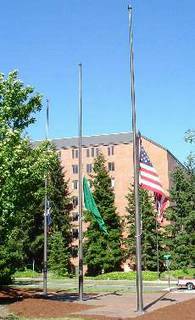 Flags at half staff on WWU campus after death of Ronald Reagan. I was never a fan of Reagan. Here are some reflections on the 1980s era. Not following television, or movies, I never heard of Rock Hudson, until just before his death. Radio newscasts were speculating that this mighty figure had AIDS. The news came to me on a little transistor radio strapped to my bicycle as I was biking across Washington State for the first time. Not long after that trip, I learned that a local acquaintance of mine, Scott Lennon, had just been diagnosed with AIDS. He was one of Bellingham's early cases. Coming back from my bike trips all tanned and healthy, I had mixed feelings about hearing this news. On the one hand, of course, it was sad. On the other hand, I couldn't help feeling a little vindicated. Much of my college years, I was such an odd ball, I didn't fit into the local social scene of gay people that much. Scott was a fairly glamorous and popular guy. My gay experience was closer to being a loner. I was not very comfortable in bar settings, but being a loner had some advantages, including missing the venereal diseases going around. After Scott was diagnosed, he slowed down a bit. He devoted the last years of his life to AIDS prevention and education. Spoke at schools and many other settings. Maybe the loner wins in the end, like in the tortoise and the heir. On the other hand, it is very important to remember the phrase, "there by the grace of God go I." 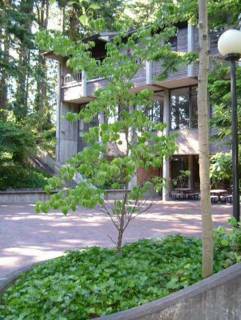 This tree was planted in memorial to Scott Lennon who lived in Bellingham and died from illnesses related to AIDS. It resides in the courtyard of Fairhaven College, a branch of WWU. I think this is the tree they planted, if my memory is correct. That whole era of the mid 1980s was colored by the Ronald Reagan's Presidency. Self-righteous thinking was a hallmark of Reagan's era. Like the cartoon I saw of Santa's slay passing over the food bank line. Santa dropped a brick that said, "get a job." It can be a cold reality. Maybe Reagan's belief in private charity took the cold edge off this picture, but only slightly. I have always believed in a balance. Personal responsibility and compassionate government. Too self-righteous a philosophy can turn around and stab one in the back. Another memory I have from the 1980s was that day Reagan fired the air traffic controllers. They went on strike wanting pay raises and better working conditions. Reagan fired them. Air controllers are government employees and he was trying to stick by his word to reduce domestic spending. The air controllers union, PATCO, had just endorsed Reagan for President in 1980, so I read. What they were thinking? Maybe they had it coming. I couldn't help feeling a bit self-righteous about the air controllers also. I never voted for Reagan. It seems like we need balance. Personal responsibility is very important, but compassion is needed also. One must never forget the phrase, "there by the grace of God go I."